Looking at climate change in RE is an important opportunity to consider the effect human beings have on the environment. 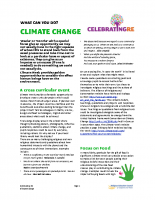 You may like to develop a cross-curricular event as part of Climate Week which could involve most, if not all, subject areas. If planned well in advance, the impact could be enormous, with the benefits and outcomes lasting longer than the project itself.